When my wife and I were looking at bands to perform at our wedding we knew that we wanted something a little bit different to the normal guitar / backing musicians - which is how we decided on Pianofactor. From my first conversations with Carl to the performance on the night, everything was absolutely perfect. These guys can seriously play! We asked for a number of specific songs to be played and the band were so accommodating and flexible in making our wishes come true; particular stand outs were ‘Sweet Caroline’, ‘American Pie’ and ‘You Can Call Me Al’ - all songs that mean a great deal to my wife and I. So many of our guests have commented to us that they were the best band they have ever seen perform at a wedding and that the music made for the most amazing party! From leading congas to organising limbo i certainly wouldn’t disagree! I would have absolutely no hesitation in recommending Pianofactor and I hope that we will be able to have them perform for us again - perhaps at our wedding anniversary!? Thanks for everything guys. Charlie and Ed. Just a quick note to say a huge thank you again for Thursday night! You were all absolute superstars and a brilliant time was had by all! As you know, I was a little ‘worried’ how this type of entertainment would be received by a load of blokes, but hey, they all entered into the spirit of the evening (some more than others!) and all thoroughly enjoyed themselves – you pitched it just right – well done! Great job and thanks again. Really hope we get to work with PianoFactor again in the future! Very well received! The guys from PianoFactor were incredibly easy to work with, very polite and friendly on and off stage. The idea of getting people up to request songs proved a great idea and it was lovely to see our guests getting involved. At the very end everyone stood up and cheered for more!" Piano Factor played at our wedding and were in a word, awesome! It was the most incredible party, everybody loved every minute of it. We wish we could do it all over again! We couldnt have booked a better band and I would recommend 100% for any event. Had these guys play at out wedding on Saturday 30th Jan and they were absolutely amazing and really made the evening. Would 100% recommend to anyone!!!! A huge thank you once again! Thank you, first of all, for being so easy to work with. It made my life so easy onsite, that I could leave you with Simon and the AV team, to organise yourselves for the evening. The Awards element of the evening worked really well, so many thanks for supporting with this, and for your creative stings of music for the winners’ walk up! Thank you once again for joining us in Gleneagles. I hope we can work together again on a future event. From the easy front-end communication and laid-back vibe, to the 'on-stage' effort and entertainment on the night, PianoFactor were just great. As an aside, the set-up looks great in a a venue too. The music they play is so varied thanks to the chance for people to put in requests, something for everyone. Thanks for a fabulous evening helping us to celebrate Dad's big birthday ... he/we loved every minute of it! Fantastically talented and friendly people. They truly do put on one heluva show and had our wedding party dancing way past the end of the show PianoFactor catered for everyone of our needs without fuss, including allowing me to play the guitar with them as a surprise for my bride! Thank you again for committing so much time for my performance of Any way you want it, it allowed my missus to marry a rock star! Overall, would 110% recommend them to anybody and look forward to booking them again for our anniversary!! A very funny video testimonial from Damien and Rebecca! Thank you guys, it was a pleasure! PianoFactor, thank you for being the most amazing wedding band, you absolutely Rocked - I danced my socks off and I couldn’t be happier! Thank You! Thank you Carl, Jo, Tom and Terry. You were all absolutely fab! Everyone really loved it, you made my night! Georgia, or Lil G as she likes to be known, has skeletal dysplasia which caused her bones to fuse when she was just 18 months old. Lil G is just 80cm in height and will never grow any taller - but of course great things come in small packages! Georgia now has to try & live independently in a BIG world where everything is a complete challenge- so we hope to raise funds to help. Thank you so much for putting on a superb show for our wedding reception on the 10th May. All the guests loved your music - We've had complaints of sore feet and knees due to so much dancing - which is definitely a good thing! Thank you so much for the absolutely amazing performance you did for our wedding. We loved every moment, it was exactly how we wanted our evening to be - fun with lots of laughing and dancing! The atmosphere you created was contagious and we had so many comments from our guests about how fabulous you were. We are so pleased you performed for us and will certainly be highly recommending you!You are all incredibly talented but the real beauty was how you interacted with each other and our guests - Everyone was gutted when it was time to stop! In short, thank you for making our wedding evening perfect for us. PianoFactor have performed their Duelling Pianos show several times for me. I was impressed by the professionalism displayed by PianoFactor, from my original enquiry through to the arrival and set-up for the first show. Then they played! These guys are just brilliant at what they do - great pianists and vocalists - and awesome entertainers. Book them. You will not be disappointed! It was an absolute pleasure to work with PianoFactor who performed various well known tunes to a crowd of over 1000 high profile individuals during the drinks reception of 'An Evening with The Stars' event. The event took place at Battersea Evolution on Wednesday 16th October to raise money for the BBC's Children In Need charity. Thank you again for everything as the feedback has been fantastic, you certainly added the WOW factor to the event! Paragon Events are very much looking forward to working with PianoFactor in the near future. I’ve seen dueling pianos a few times in The New York New York Hotel in Las Vegas and desired something similar for our customer event in the evening after a trade show. The PianoFactor team literally ROCKED THE HOUSE! Our guests together with our event team had an amazing night and everyone felt that the music was played with passion. I can wholeheartedly recommend the PianoFactor Duelling Pianos show. As an American/British couple we were trying to bring the "dueling pianos" concept to a pub in Belgravia. Carl was wonderful! He and his group accommodated the space, played fabulously and just added tremendously to the evening. They were perfect! Crowd of 60 - all ages - nothing but rave reviews! After deciding that for my wedding I wanted a duelling piano show and nothing else... the hunt began online. PianoFactor was the second one to answer my inquiry and they hooked me with their openness, flexibility and friendliness. I was very upfront with what I was envisioning and with the fact that I was a student and budgeting half my wedding money to them. PianoFactor were prompt in coming up with a line-up and a plan to suit my needs musically and financially. They DID NOT disappoint. The show was amazing, exactly what I envisioned. I danced for 5 hours straight. had to take off my shoes the last 2hr. I would recommend these guys in a heart beat....and I would hire them again in a heartbeat!!! Rock on guys!!! PianoFactor provided the evening entertainment for our wedding. All I can say is that they were amazing!! Everyone was up dancing and that is no mean feat at a wedding where the guests age ranged from 3 yrs to 93 years!! They played a real mix of songs and everyone has commented on how great it was. We first saw the idea of duelling pianos in Las Vegas and never thought we could replicate the same experience in the UK. They are an extremely talented bunch and it provided the perfect entertainment for our evening reception - we cannot thank them enough!! I have been a fan of Duelling Pianos since I went to the USA in 2009 and visited a few Duelling piano bars in Las Vegas and Howl at the moon in Chicago. I was keen to see if the UK had anything to offer and was surprised to come across a few companies providing duelling pianos. We have now tried 3 Duelling Pianos companies over the last 3 years for our Christmas party and I have to Say that PianoFactor BLOW the competition out of the water!!! There has been nobody that comes even close to their professional, fun and energetic show. These guys are the REAL DEAL and we have them booked in for our party for the next 2 years. I first heard PianoFactor back in 2009 when my cousin booked them to play at her wedding. They were fantastic, so when I got engaged myself in 2012 PianoFactor was the first band I approached. From the initial consultation to the performance on our Big Day, PianoFactor were fantastic. 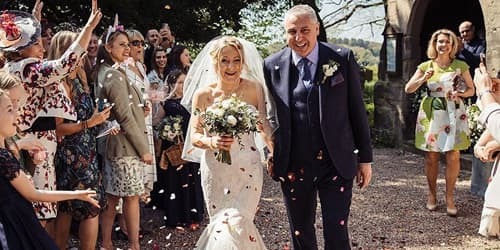 The songs were absolutely perfect for our wedding, our guests danced from start to finish and since the wedding lots of our guests have commented on how amazing PianoFactor was. They knew exactly the sort of music we wanted without us even asking for it and we truly had the best end to our amazing day. Thanks so much!! We both love the concept of duelling pianos and when we found out about pianofactor we just had to book them for our wedding. They were absolutely brilliant and had the dance floor packed through all three sets. They were funny, entertaining and very professional. Carl is great and the female singer was amazing too. The drummer provided good solid energetic drumming all night long. We're trying to think of an excuse to hire these guys again. We'll have to think up another event...!! Cheers guys, you made our night. Bride: We decided that one of the priorities for our wedding was that we wanted a live band - we knew people would be up for dancing so something to get the party started was essential. PianoFactor didn't disappoint at all! An amazing show and not just background music, everyone was up on the dance-floor immediately and loving it! These incredibly talented musicians are highly entertaining and have an amazing vibe, wholeheartedly recommended. Thanks guys! Groom: Boom! First dances done then the crowd went wild and didn't stop until Piano Factor did! Guys the vibe you gave at the event was awesome, everyone came prepared but you got them going and didn't let go. Recommend to anyone looking for a party! Despite seeing many videos on the internet of impressive performances by them I couldn't help worrying that things wouldn't work out OK (I was a nervous bride) but PianoFactor blew us and our guests away. Funny, unique, entertaining, great music and personalities - The atmosphere and fun that PianoFactor created was priceless, not to mention their mad piano skills. Your guests won't have seen anything like it before and I for sure will be contacting Carl again for my 30th birthday celebrations in 2014. Thanks guys! If you look up the definition of 'phenomenal' in the dictionary - you will find Piano Factor! #MAGNIFICENT! I had originally seen piano duelling in Las Vegas and was so excited about the prospect of something fresh, new and totally amazing for a corporate event which I was arranging for over 200 people! We wanted the wow factor, something people hadn’t seen before! We were not disappointed? You can't help but love these guys! The talent is oozing out of them! Thank you for making the event such a success! I really hope you manage to get this popular in the UK soon! People don’t know what they are missing! There's no party like a 'Piano Factor' Party! I chose PianoFactor as my wife and I love the duelling piano bars in Chicago, so we felt it would be great for our wedding. I wasn't wrong! The age ranged from 21-84 and PianoFactor had everyone on the floor. Whatever the age of the audience, classic songs, sung well, with great live voices and backing band will go down well. Every guest came to us afterwards to say how unusual and great the band were - I really recommend them very highly. It's something a bit different and it's very inclusive. People dancing, joining in with the singing - great fun. Beats the living daylights out of a boring disco for memorability! A major contribution to an awesome wedding reception, PianoFactor had the party dancing all night with some incredible music. cheers. "Thank you to PianoFactor for putting on a fantastic show at our wedding. Everyone had a great time, and we certainly didn't stop dancing all night! Was amazed by the stamina and the lack of breaks so appreciate your efforts, it certainly looks exhausting what you do. Great singing, great piano playing and great drumming, good job!" Electric is the only way to describe the atmosphere in an audience with PianoFactor. Entertainment at it's finest and highly recommended to anyone looking for a fantastic fun time to be experienced by all! Love this band! I booked PianoFactor for my 40th, having seen them fill the dance floor all afternoon and evening at a wedding where I was best man. I was confident that they would do the same for the 200 or so people that came to my party – I was not wrong! People cancelled taxis, walked home, and some didn't go to bed, just so that they could stay and enjoy PianoFactor's ability to entertain. Just great music from a wide range of genres; I would have no hesitation in booking them again or in recommending PianoFactor to anyone thinking of having a party where you want your guests to love and remember the entertainment. A true musician and entertainer Carl puts on a show which never fails to captivate even the most musically educated audiences. With his energetic performances this is a show that will keep you entertained from beginning to end. 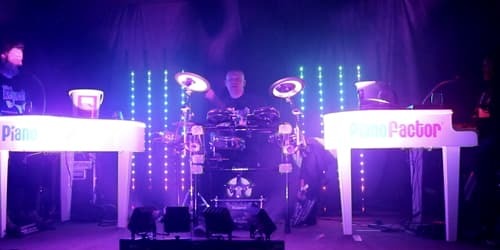 Having heard Carl play on a number of occasions we were thrilled that he agreed to play at our wedding in May 2009 - Carl never fails to get the party started!! Carl was very well prepared and spent several hours on the morning of the wedding making sure that everything was set up correctly. He started with his own version of our first dance song, which he had worked on at our request and which we loved. He got everyone up on the dance floor for the whole night, with all of our favourite songs and a few medleys thrown in. We received so much fantastic feedback on the night and afterwards - a number of people said that Carl's gig was the best they had seen at a wedding - we just didn't want him to stop!! I wouldn't hesitate to recommend Carl to play at weddings or other events, he is a true professional with an amazing voice and the ability to get everyone on the dancefloor, regardless of age or taste in music. He's a star!! Carl Williams is a true entertainer, we have been privileged enough to have seen Carl play on numerous occasions and all were made memorable by Carl's absolute mastery of the piano and ability to play to the crowd. We've seen Carl play at wine bars, weddings (ours) and various parties each time he has amazed us with his energy, perfect line up and timing which are all sweetly tailored to the audience. so get him booked before we do again! "Crazy" Carl has worked in the best piano bars in Norway for over a decade, and he is most likely one of the most talented piano entertainers in Norway. He is sought after, and his experience and energy creates a great atmosphere wherever he is. Carl is always updated on new material, and he is looked upon as one of the most complete piano entertainers who has ever played in Norway. Carl Williams has done a most respectable job the past few years, so his reputation of being among the very best is well-deserved. Carl is not only a great musician and a competent singer, but he is also an amazing show-maker - hence the nickname "Crazy Carl". Those who has seen Carl once will definitely come to see him the next time they see his name on the poster.